The Quails Activity Sheet for Kids – Download our educational yet entertaining fun FREE best online science hidden words activity to print about Quails. 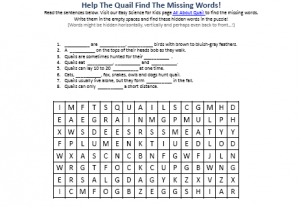 This activity sheet all about Quails has a fun search-a-word puzzle in addition to a find the words hunting game. You are free to download, print and use our hidden words activity sheet as many times as you need. Our free science hidden words activity sheet about Quails is ideal for kids in Junior school in Grade 1 to 5 and for Kindergarten kids and kids in Preschool. Young children up to Grade Five can enjoy playing the word seek puzzle and learn fun facts about Quails. The fun facts about Quails activity sheet is a fun way to get your kids interested in science and gain their attention during early learning activities or homeschooling science activities. Kids in Elementary school from Grade 1 to 5 can use this Quails facts for kids activity sheet as a reading comprehension worksheet. Your children shall learn well because they will most likely need to read more than once the facts about Quails to find the missing words. This is a great exercise for kids to remember what they read, while improving their reading comprehension skills. Younger kids in Kindergarten and Preschool who do not yet know to read can enjoy our free best online Quails activity sheet as a fun listening comprehension activity. Parents or Teachers can read out loud the Quails fun facts and then ask the children to remember what the missing words are. Preschool kids can also have fun playing the hidden words puzzle and use it as a tool to learn to recognize letters and words. Parents can use our free to print Quails activity sheet to do fun science activities with their kids and spend quality time teaching their kids about Quails. Teachers can use our best online science hidden words activity sheet to supplement science classes at school and to make learning about Quail birds interesting for kids. Tutors and Teachers can use our free hidden words activity to print for after-school education programs or homeschooling activities. Our science made simple for kids website offers the best free online science hidden words games and free to print science activity sheets for kids. Use our science word puzzles to make learning science interesting and fun for your kids! The distinctive call of the quail will wake you up in the morning when you spend the night in the Arizona desert. This ground bird is found in many parts of the United States. Quails eat seeds, grain and insects. They mostly spend their lives on the ground, that is why they are considered ground birds or game birds. Learn more fun facts about Quails by downloading this fun science hidden words puzzle! [sociallocker]Download the best online science hidden words activity sheet about Quails. Download the FREE Quails Activity Sheet for Kids! Do you like the Free Quails Activity Sheet? Read lengthy information about Quails here. Declan, Tobin. " Quails Activity Sheet - Free Best Online Science Hidden Words Activity to Print - ." Easy Science for Kids, Apr 2019. Web. 23 Apr 2019. < https://easyscienceforkids.com/quails-activity-sheet-free-best-online-science-hidden-words-activity-to-print/ >.